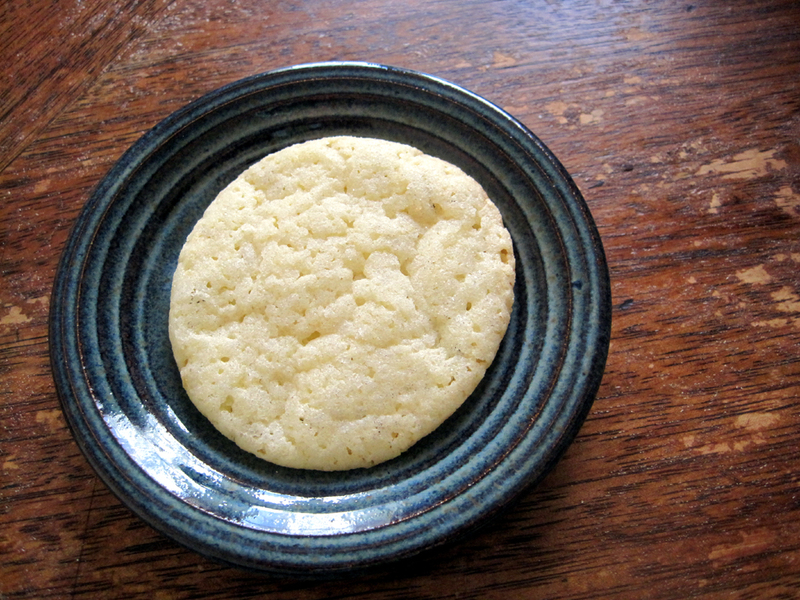 These lemon cookies are simple yet satisfying. They've got a bit of crunch on the outside from being rolled in sugar before baking, but the centers are total chewy cookie bliss (I'm a total sucker for chewy cookies!). I'd call these cookies more lemon-scented than anything else - they've got that lovely floral lemon flavor without being at all sour. I made these for an event at church, and they're perfect for a big gathering as the recipe is easy and makes lots of cookies. 1. Preheat oven to 350 degrees. Line cookie sheets with parchment or foil. 3. In a larger bowl, beat together the butter and sugar until fluffy. Beat in the egg, vanilla, zest, and juice. 4. Add the dry ingredients, and beat until just combined. Roll tablespoon-fuls of the dough into balls and then roll in sugar. Place on cookie sheets, 1-2 inches apart. 5. Bake 8-10 minutes. Let stand on cookie sheets for a minute or two before moving to wire racks to cool. 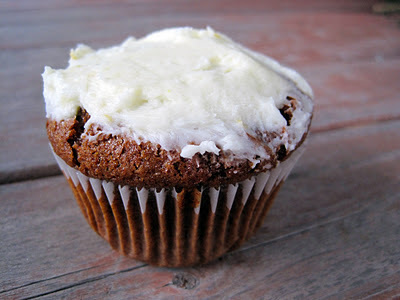 These gingerbread cupcakes are intensely ginger-y, with a deep molasses flavor and a great kick from half a cup of dark beer. The cupcakes come from a cookbook that aims to create a more butch cupcake - most of the recipes include beer, bacon, whiskey, rum, coffee, pretzels, chilies, or some sort of other 'manly' ingredient that doesn't typically show up in cupcakes. I don't know if these cupcakes really appeal more to men (I've found they'll eat pretty girly cupcakes if they taste good! ), but they certainly are delicious, and I think the flavors would be enjoyed by anyone. 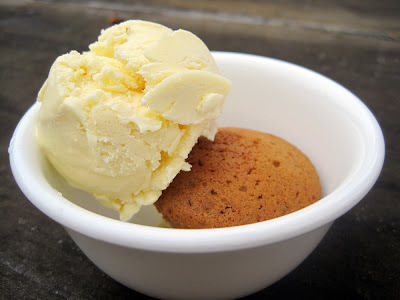 I was really skeptical of adding two whole tablespoons of ground ginger to such a small batch of cupcakes (not even two dozen), but it actually really works and makes for a super-flavorful dessert. I paired the cupcakes with a simple lemon frosting, just because I think lemon and gingerbread go really well together, but you could also use vanilla, ginger, or chocolate depending on your preference. 1. Preheat the oven to 350 degrees and place 15 cupcake papers in muffin tins. 2. Whisk together the flour, baking soda, ginger, allspice, cloves, and salt. Set aside. 3. In a medium bowl, whisk together the brown sugar, oil, molasses, eggs, and vanilla until creamy. Beat in the flour mixture, combining well. 4. In a small saucepan, heat the beer almost until boiling. Slowly add it to the cupcake batter and whisk in to incorporate. 5. Fill each muffin cup about 3/4 of the way full. Bake until a tester comes out clean, about 20 minutes. Let cool. 6. Once the cupcakes are cool, make the frosting. Beat the butter until creamy. Beat in the powdered sugar until smooth. Beat in the lemon juice and zest. Taste, and beat in more powdered sugar to taste (and/or to get the consistency you like). Frost the cupcakes immediately. Have I mentioned lately how much I love the Create Your Own feature from Fine Cooking? I loving playing around with different flavors to either accommodate what I have in the fridge or to create something unique without straying too far from a formula that works. I've made two meatloaf recipes based on their meatloaf feature, a fantastic bacon-wrapped fennel-turkey meatloaf and this delicious southwest version that I made with my mom. It features bell peppers, cilantro, cumin, and an incredible chipotle-ketchup glaze. I like that it's got enough of that familiar meatloaf flavor to feel like comfort food, but with a spicy twist. You can add more or less red pepper flakes to dial up or down the spiciness - the amount here makes a fairly spicy meatloaf along with the glaze, which we really liked. 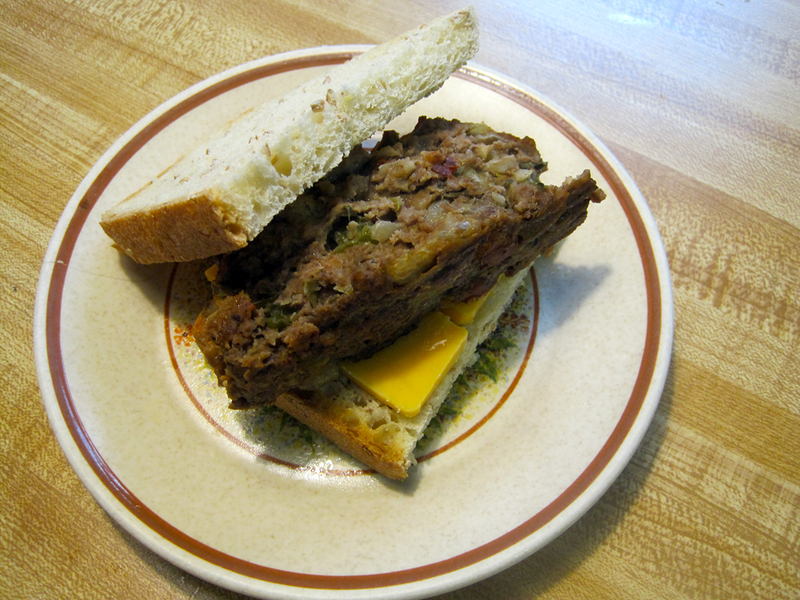 Plus, like most meatloaf, this one is even better the next day, made into a meatloaf sandwich! 1. Heat the oil in a skillet over medium-low heat. Cook the onions, peppers, and garlic, stirring frequently, until softened and just beginning to brown, 6-8 minutes. 2. Add the sherry and simmer briskly until almost dry, about 5 minutes. Transfer to a bowl and let cool slightly. 3. In a shallow dish, soak the bread in the milk, flipping once, until soggy but not falling apart, 5-10 minutes. Lightly squeeze to remove some of the milk, finely chop, and add to the onion mixture. 4. Preheat oven to 375 degrees and line a cookie sheet with parchment. 5. Combine the beef, egg, and onion mixture in a medium bowl. Gently stir to just combine. Add the scallions, cilantro, oregano, Worcestershire sauce, cumin, and red pepper flakes to the bowl, and then sprinkle over the salt and pepper. Gently mix everything together until just combined, being careful not to compact the meat. 6. Form the meat mixture into a loaf on the baking sheet. Spread the glaze all over the top and sides in a thin layer. 7. Bake until an instant read thermometer registers 160 degrees in the center of the meatloaf, 30-40 minutes. Let rest 10 minutes out of the oven, tented with foil, and then slice and serve. Unfortunately I couldn't get a great photo of this salad, but I had to share it anyway because it was so tasty! It's perfect for winter - citrus contributes sunny, bright flavor; dates, a sweet chew; hardy baby greens make the salad feel more hefty and appropriate for cold months; and walnut oil adds a great nutty flavor. I'd never used walnut oil before, but I love it - the flavor really comes through without being overly intense or bitter. If you want to pump up the walnut flavor, you could add toasted walnuts for crunch -- I went with pine nuts because that's what I had on hand, which was also a great choice. I first discovered baked oatmeal about a year ago at Christmas when my sister made it for breakfast. This year, we couldn't find her recipe but luckily we came across this one from Super Natural Every Day on a few different blogs. 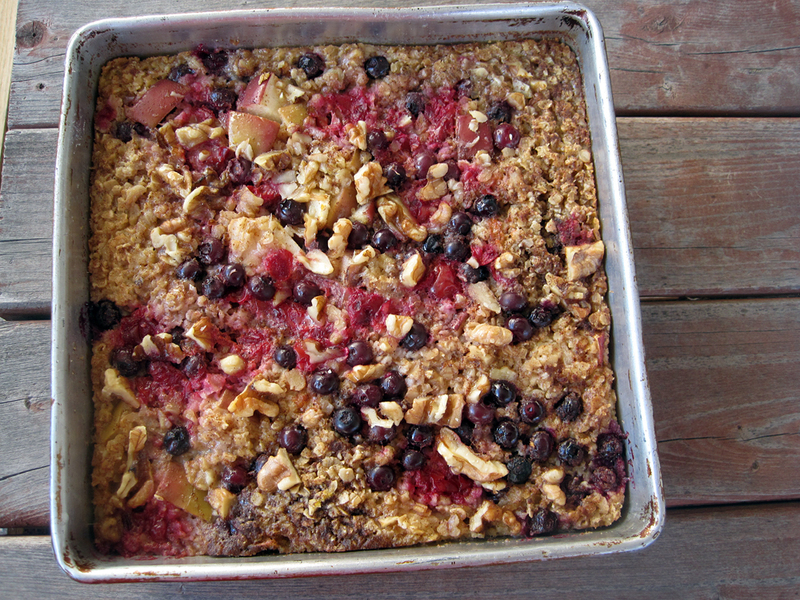 Baked oatmeal is a great way to make oatmeal for a crowd, and it's also fantastic leftover. I'm planning to make some to keep in my fridge for quick breakfasts throughout the week - it heats up well in the microwave and is great with a splash of milk on top. 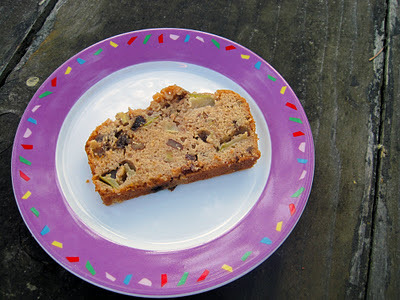 I also like that the recipe is easily changed up to accommodate whatever fruits and nuts you like or have in the house. For example, I'm a huge banana hater, so we subbed in chopped apple and peach. Frozen fruit works well here; just make sure it's chopped into bite-sized chunks before going into the pan. 1. Spray an 8x8 pan with oil and preheat the oven to 375 degrees. 2. Stir together the oats, half the nuts, the cinnamon, the baking powder, and the salt. Set aside. 3. Whisk together the milk, eggs, maple syrup, half of the butter, and the vanilla. 4. Scatter half the fruit in the bottom of the pan (we used chopped apple and chopped peach for the bottom layer). Top with the oat mixture. Slowly pour the liquid ingredients over the oats and tap the pan a few times on the counter to make sure it's evenly distributed. Top with the remaining fruit (we used cherries and blueberries) and the remaining nuts. 5. Bake 35-45 minutes, until the top is browned and the oats are set. Remove from oven and drizzle with the remaining melted butter. Tent with foil and let rest about 10 minutes before serving. The baked oatmeal is delicious plain or with additional maple syrup. I didn't used to think I liked coleslaw, I think because I'd only had the limp, gloppy stuff you often see in cafeterias. Once I discovered vinegar-based coleslaw, I realized that this dish can instead be a bright, crunchy side that showcases fresh veggies. 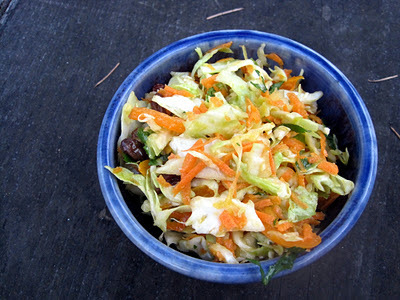 This particular slaw is dressed with a lime-and-olive oil dressing with a bit of spice from hot sauce and cumin, so it's a little less acidic than a vinegar-based slaw but it still has lots of flavor. This simple, tart coleslaw is the perfect topping for a pulled pork sandwich, as it provides some needed acid without overpowering the meat. It would also be great for an outdoor picnic since it doesn't include any mayonnaise. 1. 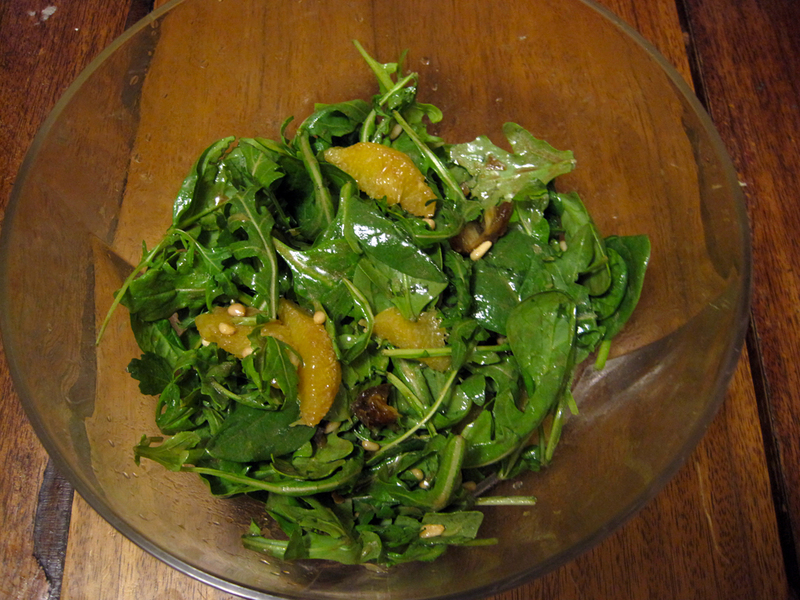 Make the vinaigrette: Warm the oil in a small pan over medium heat. Add the cumin and heat until fragrant. Let cool. 2. Combine the cumin oil with the lime juice, garlic, ginger, honey, and hot sauce in a blender, and blend until smooth. 3. Toss together all of the slaw ingredients, and then toss with the dressing. Season to taste with salt and pepper. My mom and I made this roast beef for New Year's Day dinner, and it was a big hit - even among those who don't like beef too much! 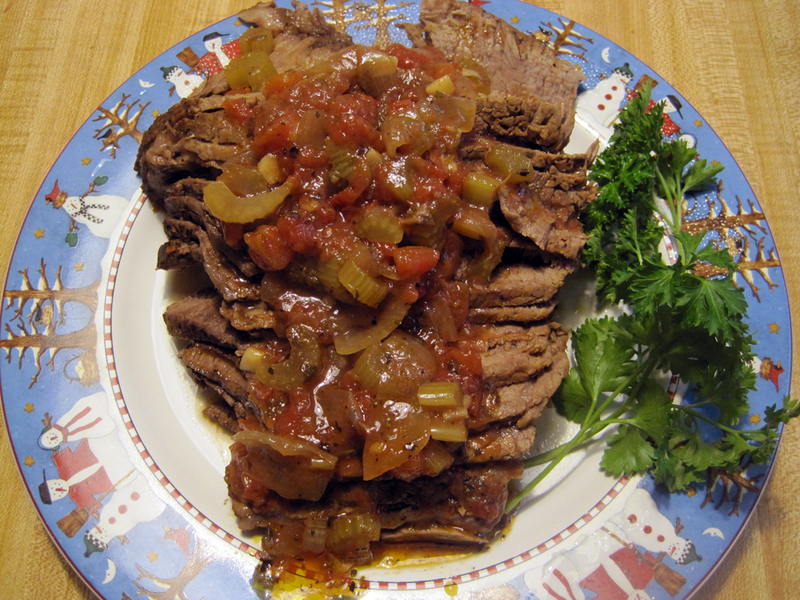 The beef is moist and tender with fantastic flavor, and the tomato-red wine sauce served on top is really delicious. The key is to slice the beef very thinly, so if you have an electric knife, this is the time to pull it out. (I don't, but now that I've tried my mom's electric knife, I think I may have to get one - it made slicing up a big piece of meat a breeze!) On the side you can see parsley from my mom's garden...somehow it survived the Ohio winter and was bright green and tasty! 2. Season the beef all over with salt and pepper. 3. Heat oil in an oven-safe Dutch oven or other large pot that has a lid - use enough oil to generously cover the bottom of the pan. Brown the beef on all sides and then transfer to a large plate. 4. Pour off all but about a tablespoon of the fat, and then add the onion and celery. Season with salt and pepper and saute until beginning to brown, about 8 minutes. Add the garlic and Italian herbs and saute for about a minute. Add the tomatoes and cook for 3 minutes, stirring frequently and scraping the bottom of the pan. Add the wine, bring to a boil, and boil five minutes. Add the chicken broth, return to a boil, and boil another five minutes. 5. Return the beef and any accumulated juices to the pot. Cover and transfer to the oven. Cook for about 45 minutes, and then flip the beef over. Re-cover and continue to cook until tender, about 45 minutes to one hour more. 6. Transfer beef to a cutting board and tent with foil. 7. Spoon the fat off the liquid remaining in the pot and bring to a boil. Boil about 7 minutes, until somewhat reduced. Taste and season the sauce with salt and pepper if needed. 8. 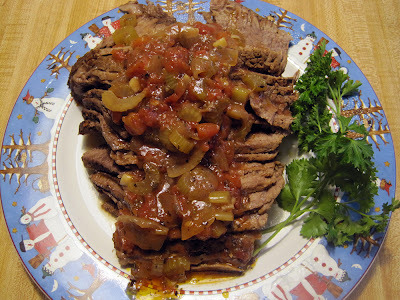 Cut the beef into thin slices and serve with the sauce. 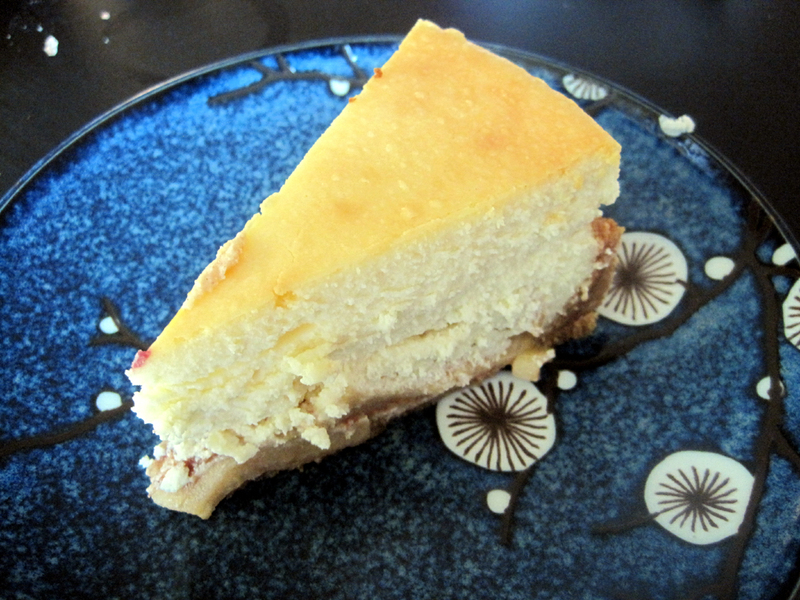 I made this cheesecake all the way back at Thanksgiving (yes, I'm behind on posting recipes!). I came up with the idea because I saw a lot of versions circulating some of my favorite blogs, and the combination of apple pie and cheesecake just sounded too good to pass up. We were also planning on having four different pies for Thanksgiving, so it seemed like a good idea to make one of them a little different than usual! This cheesecake absolutely delivers on both the apple pie and the cheesecake front. The cheesecake is creamy, tangy, and just sweet enough, while the pie layer features a thin-but-flavorful layer of soft-but-not-mushy apples in a sweet, cinnamon-y syrup. I used a 9-inch round springform pan, which just barely contained all of the batter; if you make this in a 10-inch pan, you could add even more apples, which would make the layers more even (as it is, there is way more cheesecake than apple pie filling - not a bad thing, but just depends on the balance you like). One tip - when you take the pie out of the oven, make sure to cool it on a rack set over a plate or baking sheet, as I got quite a lot of leakage through the pan. I was worried I'd end up with a super soggy crust, but it was actually all good (except for my slightly messy table!). 1. Wrap a 9- or 10-inch springform pan with foil. Get a larger pan ready to use for a water bath, and boil water to use in the water bath. Preheat the oven to 350 degrees. 2. Make the crust: Grind up the graham crackers in a food processor. Add the sugar and pulse to combine. Add the butter and pulse until the mixture has a fairly uniform texture. Press half the crumbs into the bottom of the springform pan and the other half into the sides (they won't go all the way up, but that's okay). Place the springform pan on the larger pan and set aside. 3. Make the apple layer. Gently toss all the ingredients together and pour into the springform pan, trying to get the layer as even as possible. 4. Make the cheesecake layer. Cream together the cream cheese, sugar, and flour. Add the milk and beat to combine. Add the eggs one at a time, beating until combined after each addition. Add the sour cream and vanilla and beat to combine. Tap the bowl on the counter a few times to get rid of any air bubbles. 5. Pour the cheesecake over the apple layer and place the pan in the oven. Pour the boiling water into the outer pan to create a water bath. 6. Bake 60-90 minutes, or until the center is almost set (baking time may change depending on your pan size). Turn off the oven and let sit 3 hours or until room temperature. Chill overnight. 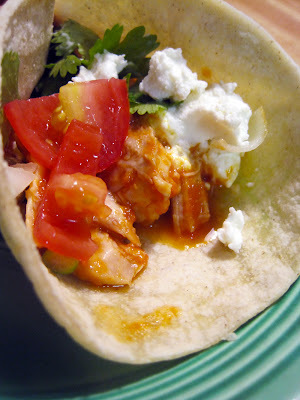 These chicken tacos pack a spicy punch full of chipotle flavor - I love chipotles in adobo since they're such an easy way to add great flavor to a dish. If you're not such a fan of spice, you could use half the amount of chipotles and I bet the sauce would still be great. Although this dish has quite a few steps - brown the chicken, make the sauce, puree the sauce, bake everything together, and then shred the chicken - the recipe makes a ton of food and the leftovers keep well. You can go for more chicken, which kept well in the fridge for a few days. Or, if you go with the smaller amount of chicken, you'll have tons of leftover sauce which has a lot of great uses. We cooked about a pound of boneless thighs, which made enough tacos for four people. We had enough sauce to enjoy as a fantastic spicy salsa once chilled, plus enough for a batch of baked enchiladas that was super easy and delicious (just pour the sauce over enchiladas filled with your favorite fillings, top with cheese, and bake until bubbly). 1. Heat enough oil to cover the bottom of a large non-stick skillet over medium-high heat. Season the chicken all over with salt and pepper and then brown in the skillet, turning once. Work in batches if needed. Transfer the chicken to a 9x13 baking dish. 2. Add the onions to the skillet, adding more oil only if needed. Cool over medium-high heat, stirring occasionally, until the onion is lightly browned and softened, five minutes. Add the garlic and cook until fragrant, two minutes. Add the tomatoes and their juices, the chipotles, and the chicken broth, and bring to a boil. Reduce heat and simmer, stirring occasionally, for 20 minutes or until the sauce is thickened and slightly reduced. 3. Preheat the oven to 350 degrees. Let the sauce cool slightly, and then puree in a food processor or blender, or with an immersion blender - be very careful with pureeing hot liquid! Taste and season with salt and pepper. 4. Pour the sauce over the chicken. Bake uncovered for about 45 minutes, until the meat is tender and the sauce is thick and darkened around the edges. Warm the tortillas. 6. Fill warm tortillas with the chicken tinga mixture and any toppings you like. Tim and I made this recipe before Christmas - it's a family recipe of his dad's, and is perfect for when the cold weather and fog rolls in. Full of warm spices, apples, raisins, and nuts, this bread is a wonderful breakfast or snack on a chilly day. My favorite way to eat this bread was with sharp cheese - I can't remember the name now, but we'd picked up a really fantastic hard cheese at Cowgirl Creamery earlier in the weekend. Something about apples and cheese together always floats my boat. This recipe makes two loaves, but if you only need one you could cut it in half or freeze the extra - Tim says this recipe freezes well. 1. Grease two 9x5 loaf pans and line the bottoms with parchment. Grease the parchment. Preheat the oven to 325 degrees. 2. Whisk together the flour, baking soda, salt, and spices. Set aside. 3. Beat together the sugars, butter, and oil. Beat in the eggs one at a time, and then beat in the vanilla. Stir in the apples, raisins, and pecans. 4. Add the dry ingredients to the wet ingredients and mix until combined. Scrape into prepared pans. Bake 20 minutes, and then pull out the rack and sprinkle the loaves with the cinnamon-sugar mixture. Bake for another 40-50 minutes, until a tester comes out clean. Cool in pan for ten minutes, and then turn out onto a rack to finish cooling. Freezes well. 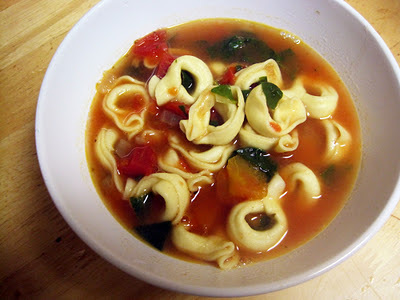 The other week, Tim was in the mood for tortellini soup and we were able to find a great recipe on our drive home from Santa Cruz. I've made it again since, because it's so easy and delicious. You can make this soup in about 15 minutes, start to finish, so it's the perfect dinner when you're in a rush but still want something homemade. Despite the short prep time, this dish is definitely not short on flavor - the key is definitely making sure to get your onion and garlic a little browned and then to use good-quality tortellini (I like the refrigerated tortellini from Trader Joe's). Because the pasta will soak up liquid if it sits for a long time, this soup isn't as good leftover - definitely edible, but not as good as fresh from the pot. If you'll only need a portion of the soup for dinner, you could package up half the broth in the fridge and then just cook half the tortellini in the remaining broth - when you're ready for leftovers, just cook up the rest of the tortellini in the remaining broth. This soup is fantastic with a baguette and butter on the side. 1. Heat the oil in a large pot over medium heat. Add the garlic and onion and cook until the onion and softened and the garlic is lightly browned, about 5 minutes. 2. Add the oregano, broth, tomatoes, and salt and pepper to taste. Bring to a boil and add the tortellini. 3. Cook the tortellini according to package directions (will depend on whether you use fresh or frozen). One minute before the tortellini is finished, add the spinach and stir to combine. 4. Once the tortellini is cooked, remove from heat and serve topped with Parmesan cheese. This delicious beef stew recipe is actually one of Tim's, but since I helped a little I figured I'd share it anyway - you definitely won't want to miss it! It's deeply flavored from red wine and tomato paste, and the beef is balanced with lots of tasty veggies. This recipe involves more prep work than some crockpot recipes - browning the meat, sauteing the aromatics, and deglazing the pan. 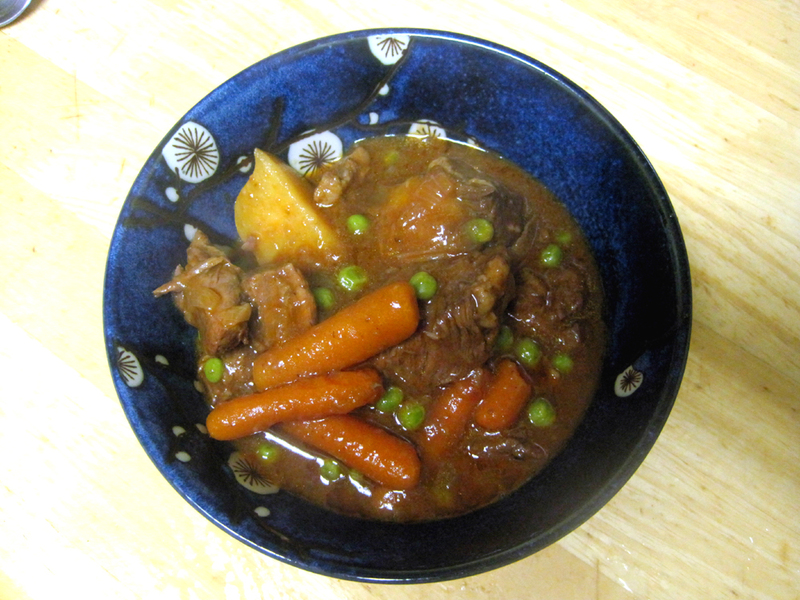 But, that prep work is more than worth it as it makes the end result so yummy - and after the prep work is done, you can leave the stew to cook in the crockpot all day. 1. Coat the beef in flour. Heat some oil in a non-stick pan (enough to cover the bottom of the pan). Brown the beef, working in batches if necessary. Remove the beef to the slow cooker. 2. Add the onions to the skillet and cook until softened over medium heat, about 10 minutes. Stir in the tomato paste and coat the onions. Transfer to the slow cooker. 3. Deglaze the pan with the wine and then pour into the slow cooker. Add the potatoes, carrots, broth, salt, oregano, and bay leaf. 4. Cover and cook on low for 7-1/2 hours. Add the peas and heat for about 10 more minutes, until heated through. I recently won a fantastic giveaway from She Wears Many Hats for a mini cupcake maker from Babycakes - it's basically like a waffle iron but instead of waffles it makes mini cupcakes, muffins, and pies! This was a really fun thing to win because it's probably not something I would have bought for myself, but I've definitely been having a fun time with it. One of the first things I made was gingerbread cupcakes, mostly because we happened to have all the ingredients in the house. Since lemon goes so well with gingerbread, I decided to whip up a batch of lemon custard ice cream with some of the Meyer lemons from the tree in our backyard (oh California, I love you!). The cupcakes were simple and tasty, but the ice cream was definitely the star of the show - it's not super tart, but instead is perfectly creamy and bursting with floral lemon flavor. It tastes just like my mom's lemon custard, except frozen! This was a delicious and festive dessert - definitely a hit. 1. In a medium saucepan, combine 1 cup of the cream with the milk, sugar, and a pinch of salt. Warm over medium-high heat, stirring occasionally, until the sugar is dissolved and tiny bubbles form around the edges of the pan, 3-4 minutes. Stir in the lemon zest. Remove from heat, cover, and let sit for at least one hour. 2. Prepare an ice bath with the inner bowl holding at least 1-1/2 quarts. Pour the remaining cup of cream into the inner bowl and set a fine mesh strainer on top. 3. In a separate bowl, whisk together the egg yolks. 4. Re-warm the cream mixture over medium high heat until tiny bubbles form around the edges of the pan. In a steady stream, pour the cream mixture into the eggs, whisking constantly. 5. Pour the custard mixture back into the saucepan and cook over low heat, stirring constantly and scraping the bottom of the pan with a heatproof silicone spatula until the custard thickens slightly (about 175 degrees on an instant-read thermometer, 4-8 minutes). 5. Immediately strain the custard into the cold cream in the ice bath. Press firmly to extract as much liquid as possible. 6. Cool the custard to a little under room temperature by stirring occasionally over the ice bath for about 30 minutes. Stir in the lemon juice. 7. Chill the custard in the refrigerator for at least 4 hours, until very cold. Freeze in an ice cream maker, then pack into pints and store in the freezer until ready to serve. 1. In a medium bowl, whisk together the flour, baking powder, ginger, baking soda, cinnamon, cloves, and salt. Set aside. 2. In a small saucepan, combine the brown sugar, butter, corn syrup, and molasses and heat over low heat, stirring frequently, until the butter is melted and the sugar is dissolved. Pour over the flour mixture and whisk to combine. Add the egg and milk and whisk to combine. Since paying around $8 a jar for amazing Happy Girl pickles is just not a sustainable life plan for me, I decided I needed to learn how to pickle! 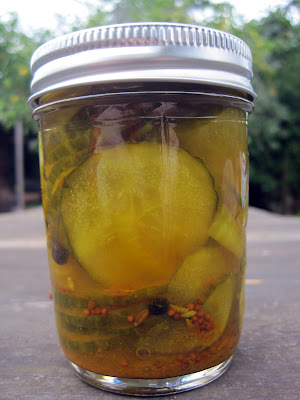 Improving my pickling skills is definitely a goal for 2012, although this particular jar is from the end of 2011. These bread and butters aren't quite the Happy Girl pickles, although they're very good. Part of the problem was user error - I cut these a bit too thin and cooked them too long, so they ended up not as crunchy as they could have been. This recipe is also not as sweet as many bread and butter pickles, which may be a good thing depending on your preferences - I tend to like a slightly sweeter pickle, but of course your mileage may vary. I'd say these are sort of halfway in between a sweet pickle and a sour pickle - definitely very tasty on a cheese sandwich! Even though these aren't quite the Happy Girl pickles, I did really enjoy them, and I'll keep on searching for pickle nirvana in the new year! 1. Toss the cucumbers and onions together with 1/2 cup of the salt in a large bowl and cover with a layer of ice cubes. Set aside for two hours. Drain and rinse in a colander. 2. Combine the vinegar, water, sugar, spices, and remaining 1 T salt in a large saucepan and bring to a boil. Add the drained cucumbers and onions and return to a boil, stirring to make sure that everything is heated through. Remove from the heat.